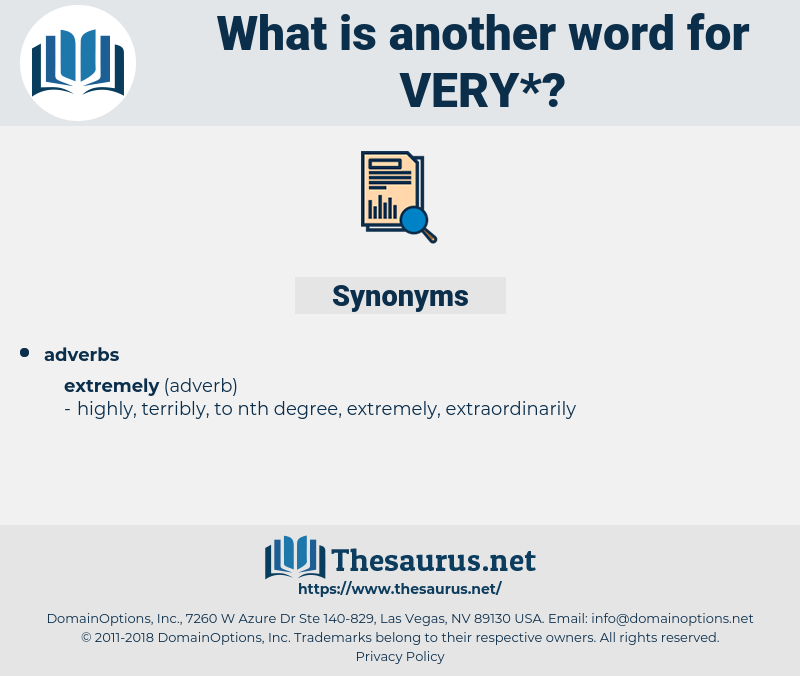 What is another word for very? quite, extremely, same, even, huge, own, enormous, pretty, utmost, simple, highest, tremendous, substantial, precise, crucial, fundamental, grave, every, specific, vast, paramount, similar, lovely. extremely, attaches, pretty, Has, Was. Hundreds, levels, Industries, Miles, implications, results, Students, Businesses, feels, users, men, looks. 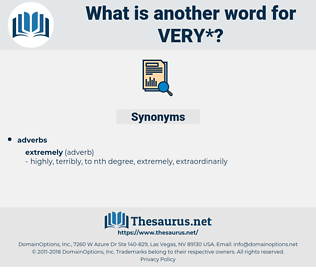 extraordinarily, particularly, enormously, exceedingly, perfectly, quite, immensely, tremendously, hugely, relatively, deeply, remarkably, vitally, awfully, best, better, abundantly, eminently, excessively, extremely, heavily, gravely, utterly, profoundly, keenly, largely, widely, crucially, sorely, substantially, genuinely, intensely, vastly, prohibitively, clearly, decidedly, overly, desperately, especially, certainly, critically, thoroughly, strikingly, earnestly, grossly, distinctly, even, supremely, fundamentally, warmly, sincerely, wholeheartedly, sufficiently, infinitely, notoriously, unusually, pretty, so, markedly, unbelievably, almost, often, overwhelmingly, lot, dramatically, closely, inordinately, wholly, extensively, altogether, bitterly, harder, equally, wildly, woefully, expressly, broadly, carefully, strictly, increasingly, frequently, surprisingly, beautifully, disproportionately, disappointingly, crystal, hotly, easily, eagerly, patently, tightly, heartily, wonderfully, hardly, amazingly, urgently, readily, dreadfully, powerfully, lovely. considered, Were, Had, stressed, Began, Knew, lost, quite, Got, Was. proved, humbled, impressed, Enjoyed, developed, Had, Viewed, Managed, emphasized, Deemed, witnessed, known, Undergone, found, seen, Lagged, fallen, filled, gone, Meant, made, Got. uncertain, supposed, hypothetical, unreal, fake, dissimilar, distinct, imprecise, chimerical, unalike, pretend, another, abstract, alleged, suppositional, platonic, fanciful, symbolic, differentiable, imagined, ideal, virtual, illusory, conceived, fictional, legendary, imaginary, diverse, dubious, reputed, discriminable, distinguishable, fabled, restricted, potential, various, questionable, qualified, varied, unlike, pictured, assumed, distinctive, Inexistent, conjectural, disparate, nonexistent, made-up, doubtful, envisioned, equivocal, visualized, fabricated, fictitious, romantic, possible, invented, theoretical. unremarkably, little, dubiously, commonly, indefinite, doubtfully, usually. You know very well that there is not. He must be very good.